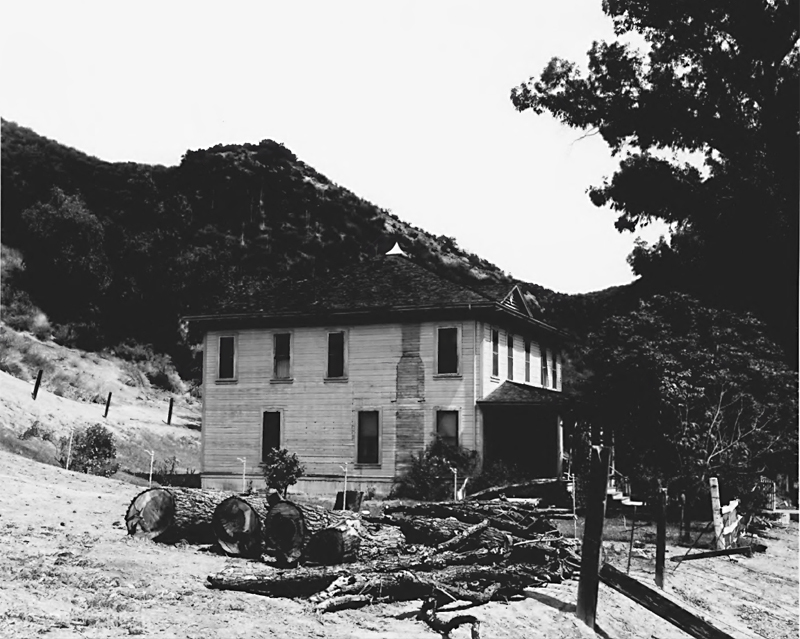 The "Big House" at Mentryville, aka the Pico Cottage, 1961. National Park Service photograph. When this photograph was purportedly shot, the Alton Manzer family had recently moved into the house (1960-1966). This photograph is interesting for a few reasons. The chimney on the left (west) side of the house  visible in this earlier, undated photograph contributed by Darryl Manzer  has either just fallen off or has been removed. Why? Some eucalyptus(?) trees have been recently cut down. Why? Note the dilapidated condition of the fencing compared to the earlier photograph. Most peculiar is the incription on the back of the photograph (at right), identifying the structure as the "Oilmen's Hotel." We don't know it to have served as a hotel or boarding house for oil workers. To the best of our knowledge, the house was owned by the oil company (Standard Oil of California after 1908, Chevron USA after 1977) and leased to one family at a time  that of the oil field superintendent or foreman. 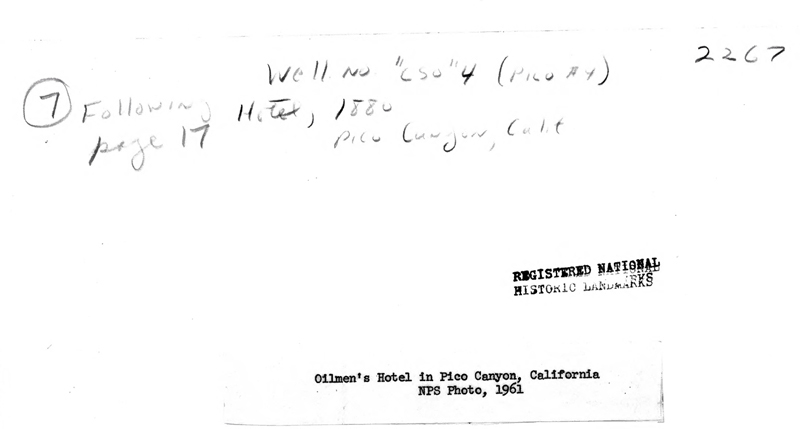 The date is wrong in the penciled notation that that appears to say, "Hotel 1880." The house was completed in 1889. Pico No. 4  actually "Well No. 4, Pico Canyon Oil Field"  is a National Historic Landmark, which would explain why this photograph is in the archives of the National Park Service. But it wasn't listed until November 13, 1966  so why the 1961 photograph when it looked better before and after?